Of all the glorious mountains the surround Whistler, The Table has got to be one of the most unique. This curious flat-topped mountain near Garibaldi Lake was formed when a volcanic eruption burst up through a massive glacier, roughly 10-15,000 years ago. The fast-melting ice kept the lava flow contained on the sides and forced it to cool off and solidify quickly, while the pull of gravity caused the nearly perfect flat top. Scientists have been able to date it to quite recently since there are no signs of glacial erosion along the sides or base. This indicates that the initial eruption and formation occurred after the great Holocene ice sheets were in retreat, but obviously before they were completely gone, roughly 10-12,000 years ago. In geological terms, a flat-topped volcano formed through this spectacular interaction between fire and ice is called a tuya. These are extremely rare, being found in Antarctica, Iceland, Siberia, Coastal BC, the Oregon Cascades, and not much else. As seen from Panorama Ridge during the 1939 George Bury ski expedition. The Table sits within the midst of a highly active and scenic volcanic setting, with the Black Tusk, Cinder Cone, Mount Price, Mount Garibaldi, The Barrier, and several other nearby volcanic features. As a whole this area is called the Garibaldi Volcanic Belt, which is considered to mark the northern terminus of the Cascade Volcanoes that follow the Pacific Coast down to northern California. First climbed by BC Mountaineering Club member Tom Fyles in 1916, The Table’s steep, rotten flanks repel all but the boldest climbers. It is rarely repeated, and prospective climbers are strongly dissuaded from attempting. The Table’s distinct flat top can be seen silhouetted in front of Mount Garibaldi. No, there are no known ski descents. Maybe a local BASE jumper or speed-flyer would like to give it a shot? After all you need to get on top is shoot a rock video. With such a rare and distinct shape, it’s not surprising that this mountain has made a few appearances in pop culture. The Table served as the world’s most over-sized and epic stage for Canadian rockers Glass Tiger in their 1986 video “I Will Be There.” Make sure to keep watching for the incredible guitar solo on the Table’s edge. Also, in the sci-fi film Stargate: The Ark of Truth, The Table was used as some sort of underground spaceship base/hangar. We’re not really sure because we haven’t actually watched the film. Jump ahead to 47:30 for a few more shots of a wild man from the future (past?) trekking around Garibaldi PArk. Presumably the giant flat zone is where The Table used to be. When Vancouver-based mountaineers first began exploring around and beyond Mount Garibaldi in the early 1900s, they encountered vast mountainscapes that soon became the focal point of their clubs’ activities. Beyond the allure of the regions countless mountaineering challenges, these early visitors were equally enthralled with the overwhelming beauty of what they took to be a pristine wilderness. In some regards the Garibaldi landscape was too pure. For example, despite providing some quality habitat, Garibaldi Lake was completely devoid of fish. Garibaldi Lake was formed relatively recently (geologically speaking) when a massive lava flow from Mount Garibaldi slammed into a glacier and was frozen in its tracks, leaving behind what is now known simply as The Barrier. This vertical wall blocked off an ancient valley that subsequently filled with water to form Garibaldi Lake. Since the lake’s outlet flows underground through The Barrier to become Rubble Creek (named after the frequent landslides falling from the Barrier’s unstable volcanic rock), no fish population was ever able to colonize Garibaldi’s glacial-fed waters. And so, despite the celebrated “purity” of Garibaldi’s pristine alpine expanses, its earliest proponents foresaw the district’s potential as a tourism destination and hoped to develop the landscape in that manner. From the beginning they set about building trails and identifying the best sites to hold summer camps (Paul Ridge, Black Tusk Meadows, Singing Pass, etc). A few years later when these mountaineers began advocating for the creation for a provincial park to preserve the Garibaldi wilderness (mainly from logging and other industrial activities), plans for the development of alpine hotels and a road through the park were key elements of their campaigning. While the Great Depression and Provincial-Federal government squabbling prevented these more ambitious developments from coming to pass (thankfully, most would argue today), other more modest environmental modifications were pursued. In 1928, for example, 2 years after Garibaldi Provincial Park was established, 5,000 Kamloops Trout eggs from the federal hatchery at Pemberton were planted in a promising tributary stream of Garibaldi Lake (Mimulus Creek), and an additional 12,500 were placed there again the next year. “Kamloops Trout” were a popular game-stocking fish because of its size and strong fight that was believed at the time to be a distinct species. It is now considered a sub-species of Rainbow whose excessive size was probably caused at least as much by environmental factors as it was genetics. The widespread stocking of the Kamloops Trout throughout BC has, according to some fish researchers, led to a substantial decrease in the genetic diversity of the province’s rainbow trout population. According to the BC Ministry of Environment’s fish stocking database, there has been no further stocking at Garibaldi Lake since 1929. And none further was needed. Even by 1930, the fish seem to have flourished. In that year the Vancouver Province (a zealous booster of Garibaldi Park throughout this period), joked that the fish should be renamed “Pontoon Trout” since they resembled the pontoons of a float-plane which had ushered one of their journalists to the lake to write a feature article. Scientifically, the Garibaldi experiment was a resounding success. The trout population continues to thrive in Garibaldi without further support through stocking. 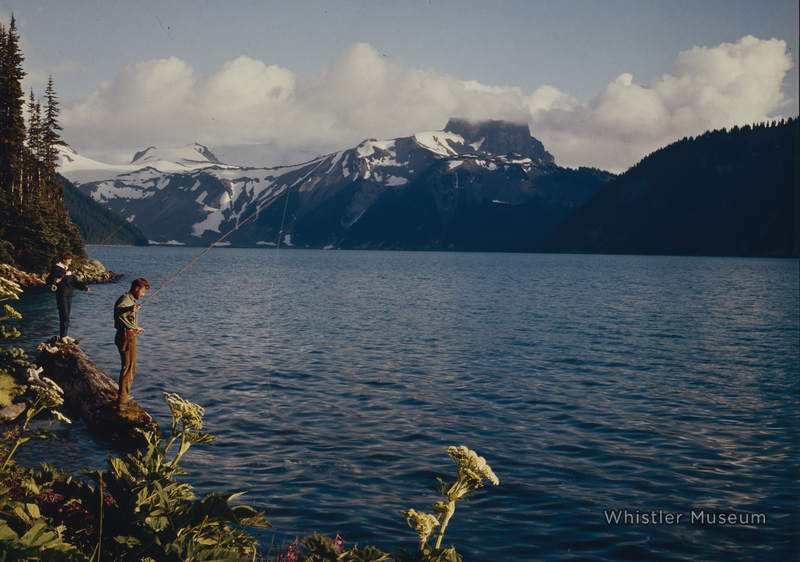 Garibaldi continues to offer decent, if not outstanding fishing, but angling has never become one of the park’s major attractions. However, a friend of mine did catch what he claims was the “skinniest trout ever”: 17 inches long but “thin as a broom-handle.” A product of the marginal alpine environment, isolated genetic population, or simply an aberration? (Any icthyologists in the house?) In any case, freak fish or not, for enduring and thriving amongst Garibaldi’s once-barren waters, these trout deserve recognition as some of our region’s hardiest and most successful pioneers. Fishing on Garibaldi Lake, opposite The Table. Circa 1960s. Photo by Cliff Fenner. Earlier this summer Pique Newsmagazine published an interesting feature on the history of fish and fishing in the Whistler region entitled “The Ultimate Whistler Fish Story”. Check it here .